Crossing Borders "Camp With A Mission"
Crossing national, cultural and personal borders with the Good News of Jesus Christ"
Watch our video summary from the 2014 Winter Trip! Crossing Borders Missions from Grace Communion International on Vimeo. 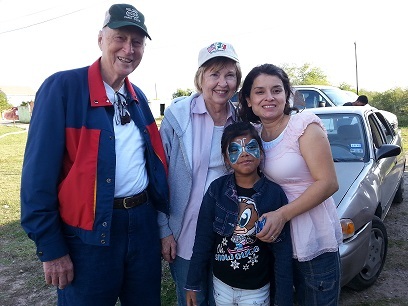 On December 12-15, 2014, Crossing Borders completed our 18th mission trip into Mexico in the past nine years. There were more people involved in this trip compared to previous trips, which created opportunity for new involvement for all concerned. More People = More Mission. How were more people involved? First, there were more people participating in preparing for the trip. When we began taking shoebox gifts into Mexico several years ago, we had three or four churches involved, donating about 150 shoeboxes. This time we had a dozen churches involved and 750 shoebox gifts to distribute to some very needy children. Also, as more people become aware of Crossing Borders, there are more people involved in praying for this ministry both as we are making advance preparations and when we travel across the border. Many thanks to all of you who remember Crossing Borders in prayer; it makes a huge difference! We also had many more missionaries participate directly in the trip this time: 35 people (from eight U.S. states as well as Monterrey and Guadalajara Mexico. On previous trips we have had 12-15 people. More missionaries equals more person-to-person interaction with the people we serve. It also means that the “mission experience and mindset” is taken back to more churches and communities by those involved, spreading the attitude to “be on mission wherever you are”—in your own family, in school, with friends and neighbors, in the workplace, and with strangers. Jesus is at work everywhere! God also brought more people than ever before for us to serve on this trip. At two of our stops on Saturday and Sunday (at locations we’ve visited on past trips), we expected to find a group of about 75-100. But the buildings were packed with over 200 expectant and joyful people. We shared in God’s love as we sang songs, had some preaching, shared some food, talked and laughed, presented a skit about Jesus’ birth, and distributed shoebox gifts to all the children and totes full of infant supplies (including beautiful handmade baby quilts) to the mothers of babies. We also visited two children’s homes and spent several hours jumping rope, doing face-painting, treating them to pizza, listening, laughing and hugging. I wish you could all be there to see the radiant faces of these children as they excitedly greet us on our arrival and soak up the love we share with them. 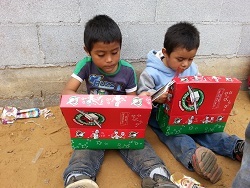 When they open their shoeboxes and unpack the simple gifts, their appreciation is an amazing sight. The accompanying photos give a glimpse of God’s love at work in these dear lives. Muchas gracias to everyone who supports these mission trips! 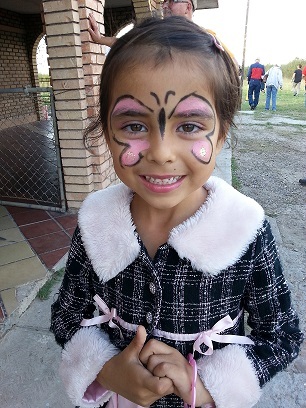 Crossing Borders’ next trip into Mexico is planned for June 20-28, 2015. Call 903-746-4463 for more information, or send an email to info@cbmission.org.